Belgrade Polymer Products developed and manufactured a range of thermoformed component handling and storage trays for a major automotive client. All custom thermoformed parts trays are supplied according to individual customer specifications. Robust and reusable, the trays are designed to hold the products, such as steering and door trim components, securely in place and deliver all-round protection during transit and use. As well as the automotive sector, Belgrade Polymer Products produces handling trays for other tier suppliers in demanding manufacturing environments, including the aerospace, electronics and engineering sectors to food and beverages. 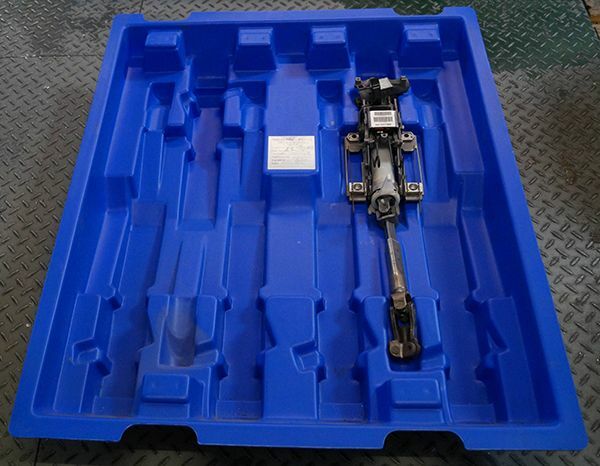 “Typical materials for moulded component trays are HDPE, LDPE, ABS and HIPS. We can offer a packaging solution that fulfils a number of customer requirements such as multiple reusability, stackability and fluid resistance as well as bespoke colours, sizes and wall thickness,” adds Patrick. Belgrade Polymer Products is ISO9001-accredited and one of the UK’s leading vacuum-forming and injection-moulding companies. Manufacturing bespoke products for a diverse range of market sectors, it has specialist expertise at manufacturing prototype items that can be quickly converted into large scale production.